On this day, King Charles II of Spain breathed his last. His reign had not been easy, his short life plagued by ill health and when he died with no heir to follow him despite two marriages, he shuffled into history as the last Hapsburg to sit on the Spanish throne. Charles had not had an easy time of it. All the privilege and royal blood in the world was of little use to him as he suffered from a number of disabilities, both physical and psychological. Charles struggled through his reign and was considered something of a distraction at court, an unimportant figure who could be sidelined and ignored. He had little or no real power and the Spanish court descended into intrigue and infighting, ruled by Regents and favourites. Towards the end of his life, Charles always weak health deteriorated even further and as it did, his psychological health also began to grow worse. His behaviour, always wayward, became utterly erratic and he became fascinated in his deceased relatives, even going so far as to have their corpses exhumed so that he might view them. Of course, the fact that he was a king meant that Charles was indulged to a point by those who quite enjoyed life under an ineffectual monarch. Once the pressure of politics drove his frays nerves to collapse, however, Charles decided to officially retire from court life. Although his post-retirement life was short, it was more happy and he was able to pass his days in undemanding activities such as simple games and sport, with the king having a particular love of shooting. 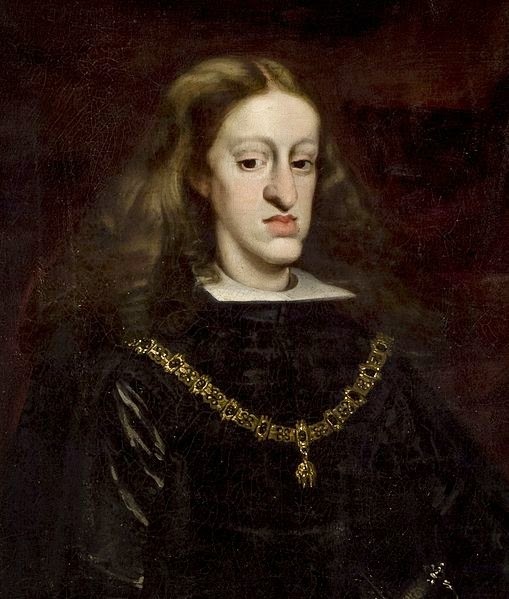 Just a few days prior to his thirty ninth birthday, Charles passed away quietly at his home, leaving no heir to take his place and plunging Spain into the war of succession. "[His corpse]... did not contain a single drop of blood; his heart was the size of a peppercorn; his lungs corroded; his intestines rotten and gangrenous; he had a single testicle, black as coal, and his head was full of water." Very interesting character, especially the fascination with his dead relatives! Eew! He definitely had psychological problems. Doubt if they knew how to deal with those problems during that time. After several generations of inbreeding, his genetic makeup was that of someone born to a brother and sister. Have a look at his family tree he was more related to himself than a sister and brother. Its pretty gross. Most people have 2 sets of grandparents. He had 1! I can just imagine the doctors getting ready for the autopsy like "Okay... Today's the day we've been waiting for, boys."